Plummeting costs for sequencing technologies have made deciphering an organism’s genome nearly routine. However, not all cells exist in the quantity these methods require—typically a few thousand to a million cells. When looking at early embryogenesis, for example, researchers might have only a handful of cells to analyze. Each cell becomes precious, explains Daniel Messerschmidt, a biochemist and principal investigator at the Institute of Molecular and Cell Biology, A*STAR Singapore. He and his colleagues wanted to explain the mechanism behind their supposedly genetically identical mutant mouse embryos’ strange phenotypic diversity. The reason wasn’t written in the DNA sequences, they suspected, but in epigenetic marks that modify gene expression. But with so few cells, “we had no way to show it,” he says. They needed a method for looking at epigenetic marks within single cells. Not to be stymied, Messerschmidt’s team and collaborators developed a way to scale down a DNA methylation assay to look at marks on specific loci in their embryos (Science, 341:1110-12, 2013). The work places them among the pioneers in single-cell epigenetics, an area that is changing how we understand genetics. Examining epigenetic modifications in single cells has applications beyond the study of gene expression in rare cells. Tumor cell populations are notoriously heterogeneous. Epigenetic errors early in development can alter gene expression throughout life, potentially causing disease. Even healthy tissues are epigenetically diverse. “The dogma has always been that the genome you inherit from your mother and father is faithfully perpetuated in all the cells of your body,” says Thierry Voet, an associate professor at the University of Leuven in Belgium and an expert in single-cell genomics with the Wellcome Trust’s Sanger Institute. But that view is changing. “Each of us are genetic mosaics,” he says. Here, The Scientist navigates the ins and outs of several key methods in the study of single-cell epigenetics at the DNA, histone, and chromatin level. 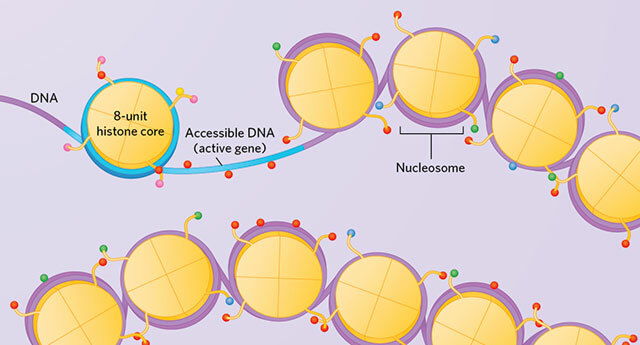 Before you can look at the epigenetic modifications in a single cell, you need to make sure you have narrowed in on the appropriate cell or cell type. If your cell type is already in suspension—perhaps as a circulating tumor cell—and relatively abundant, flow cytometry can be a great option. Solid tissues can be enzymatically disassociated to break down collagen and other extracellular proteins, but Voet cautions that digestion can be rough on the cells and even alter which genes are being transcribed. Once the tissue cells are in suspension, fluorescent markers that attach only to the cell or cells of choice can be used to isolate them. 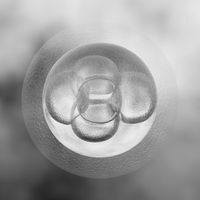 Drilling down to the single-cell level is tricky, however, and may require more advanced microfluidics, especially with smaller numbers of cells. (See “Singularly Alluring,” The Scientist, June 2014). Disassociating cells into suspension loses information about where they are positioned in tissue samples. To preserve your ability to identify the cell’s former neighbors and environmental cues, turn to laser-capture microdissection techniques. With these tools, researchers scan across thinly sliced tissues, locate the cell of interest, and punch it out of its surroundings. 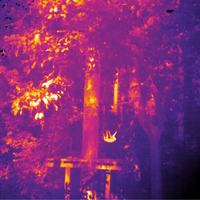 The cell can be lifted out with a sticky film and dropped onto a slide or into a tube by gravity or by using a pulse from the laser to catapult it to the correct spot. One drawback is the risk of nicking your cell and losing cytoplasm containing RNA, or bisecting the cell during the slicing process and cutting away part of the nucleus, Voet cautions. The rarest cells, however, can only be harvested manually using a capillary tube and pipetting. Once the cell has been isolated, the epigenetic marks can be assessed. Thus far, single-cell epigenetics allows only one type of assay at a time. You will need to decide if you are looking at marks attached to single nucleic acid residues, at histone modifications, or for changes at the chromatin level. Methyl groups attached to cytosine nucleotides of DNA are the quintessential epigenetic marks. Such marks usually indicate regions of the genome that have been silenced during early development as cells become specifically differentiated. Researchers have long been able to tease out which bases are methylated using bisulfite sequencing, a rather harsh chemical method that swaps each unmethylated cytosine for a uracil. After PCR enrichment, the changes are then easily detected using next-generation sequencing. In the past few years, several groups have scaled that technology down to analyze methylation in single cells. Gavin Kelsey, a molecular biologist at the Babraham Institute in Cambridge, U.K., and his colleagues, including Wolf Reik, developed a way to look at methylation patterns across all the genes of a single cell. First they had to overcome the large loss of genetic material caused by the harsh bisulfite treatment. Instead of fragmenting DNA first, as is typical, they did the bisulfite conversion on single-cell lysates and then performed an amplification step five times to generate multiple copies of the DNA fragments created during treatment (Nat Methods, 11:817-20, 2014). “We succeeded in getting pretty good profiles from single cells,” Kelsey says. The method is fairly hands-on, but not much harder than regular bisulfite sequencing. The main thing to consider is that each step along the way is a potential spot for something to go wrong. Run plenty of negative controls, Kelsey says. This will also help you narrow in on problem points when you are troubleshooting your technique. Messerschmidt’s method is also an adaptation of bisulfite sequencing, but it narrows in on particular loci of interest by using a selective restriction enzyme digest to isolate the fragments containing the genes he’d like to examine. The rest of the DNA is discarded. This step bypasses some of the potential for bisulfite sequencing to degrade the DNA you’d like to analyze and produces a more accurate result, but it is limited to analyzing a handful of genes at a time. “It’s more of a diagnostic assay in that sense,” Messerschmidt says. That also means the assay produces results faster, making it suitable for IVF embryo screening, for example. It could also be applied to looking at other rare cells, such as adult stem cells in intestinal crypts. With this method, Messerschmidt cautions, it is crucial to lyse the cell carefully and make sure you “don’t spread it all over the tube.” If smeared, the liquid evaporates quickly and your DNA is stuck inside, useless. Every effort should be made to keep your DNA in good shape. Any degradation means you’ve potentially broken the strand, and if that break occurs at the locus of interest, it will show up as a false positive for an unmethylated cytosine. For the finer points of the protocol, watch out for an updated methods paper from his group, currently in press in Nature Protocols. It’s also possible to directly visualize methylation marks, though this method is limited to examining a few cells at a time. Still, with practice, the marks are easy to detect under the microscope, and the technique can quickly produce data from a few hundred cells. Hiroyuki Sasaki of Kyushu University in Japan and his colleagues developed a way to see if specific DNA sequences were methlyated or not in single cells (Nucleic Acids Res, 41:e186, 2013). Their methlyation-specific in situ hybridization (MeFISH) binds fluorescent probes to methylated cytosines. Notably, it can distinguish between 5-methylcytosine, which just carries a methyl group, and 5-hydroxymethylcytosine, another important type of epigenetic mark. (See “Unmasking Secret Identities,” The Scientist, February 2014.) The bisulfite-sequencing–based methods described above cannot distinguish between the two. DNA strands have a host of associated proteins, including histone complexes that wind genetic material around themselves like spools, compacting the six feet of DNA inside each eukaryotic cell into a small package. In addition, all the regulatory proteins that ramp up or tamp down gene transcription are physically located on the DNA. The 3-D arrangement of chromatin can change over a cell’s lifetime and alter genes’ exposure to regulatory factors. This method is not for the fainthearted: working with such small concentrations requires meticulous attention to detail. Laue notes that Nagano is the only person he knows to get consistent results so far. Also key to the new method was the development of computational analysis employed after the sequencing step, as amplification of the DNA from such small amounts introduces a lot of noise. REPORTING LIVE: Histac probes indicate the presence and activity of epigenetic marks at specific histones. 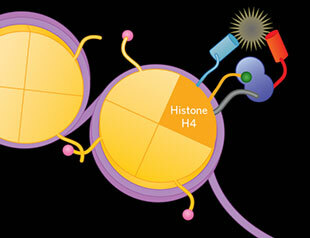 An engineered histone H4 carries two fluorescent reporters as well as a bromodomain (violet) that recognizes an acetyl mark (green) on the protein. When the mark binds to H4, the reporters (CFP and Venus) are pushed farther apart, changing the wavelength ratio of the signal they emit (shown in false-color below). To examine changes in living tissues, Kazuki Sasaki of the RIKEN Advanced Science Institute in Japan and colleagues have developed a fluorescence resonance energy transfer (FRET)–based sensor that monitors acetylation at specific histone residues. 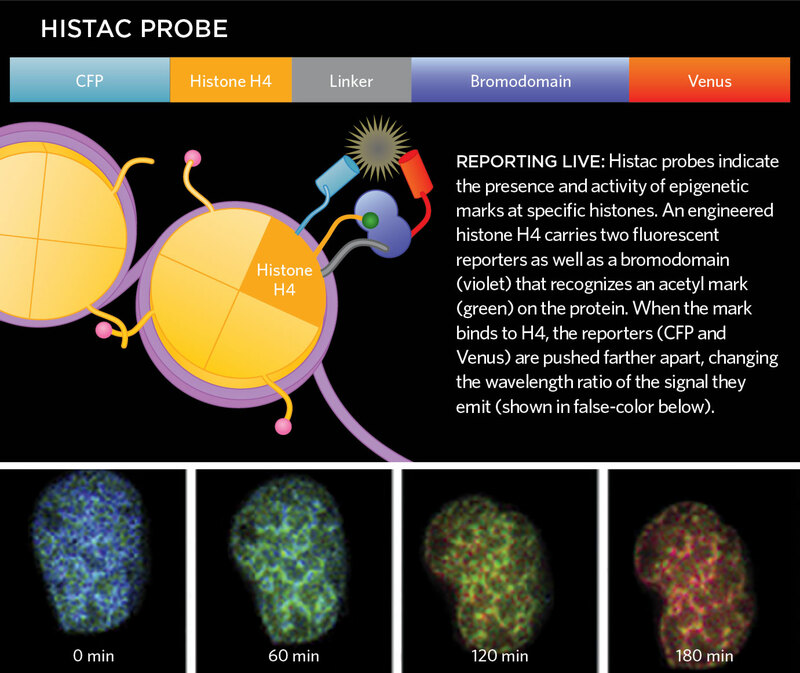 Their indicator probes, dubbed Histacs, sandwich a histone and an appropriate bromodomain that recognizes acetylation of that histone between two different fluorescent proteins. In the absence of acetylation, the Histac sensor produces a strong fluorescent signal. But when the histone is acetylated, a conformational change increases the distance between the FRET partners, resulting in a weaker signal. The group used the technique to observe acetylation changes associated with mitosis (PNAS, 106:16257-62, 2009). However, the researchers caution that thus far the probes require the addition of modified histones foreign to the cell, which could alter gene expression (Bioorg Med Chem, 20:1887-92, 2012). Future generations of Histac probes may circumvent this problem. For all these methods, working with such small amounts of material and reagents makes clean technique all the more important. When you have lots of DNA to work with, the amplification steps drown out contamination. 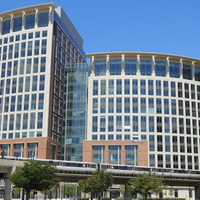 With single cells, “you get contamination anywhere in the pipeline and that will ruin the information,” Kelsey says. “Take all those precautions we used to do with PCR 20 and 30 years ago,” he advises.